March 2, 2017 By Elise 1 Comment This post may contain affiliate links. Please read my disclosure policy for more info. 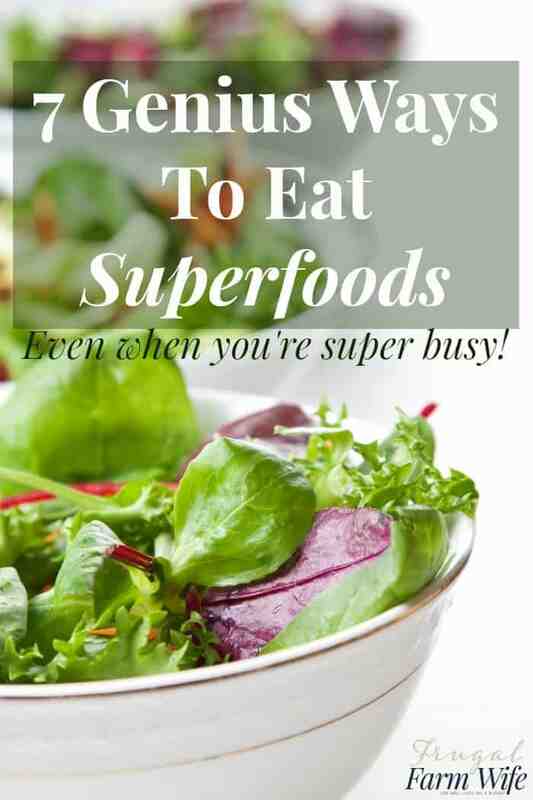 Do you have a hard time getting around to eating superfoods everyday? For me, as much as I love salad, and green food in general, sometimes, when life gets hectic, they fall by the wayside in favor of something I can grab and walk out the door with. Like a piece of jerky or *shudder* granola bar. As a stay at home (or more accurately, work at home) mom, you wouldn’t thing that sort of busyness would be a problem. But somehow, it is. Especially on Crossfit Kids days, and Sundays. But the longer I’m on this healthy eating journey, and paying attention to how the food I eat affects me, the more I realize how it’s not just a fad, it’s important to eat those superfoods everyday! Google Defines the term “superfood” as “a nutrient-rich food considered to be especially beneficial for health and well-being”. Most of us think immediately of kale when we hear the term super food – and kale certainly is the most notorious! – but it’s a far cry from the only, or even the best superfood out there. For this article’s purpose, we’re going to define superfood as dark, leafy greens, because superfood lists vary greatly with the opinion of the person who creates them, but nobody disputes the superfood qualities of kale, spinach, or broccoli sprouts. But more than that, because they’re full to the brim with micronutrients that our bodies crave. We automatically go for the fat and carb heavy foods when we get a craving. then we get upset with ourselves for eating too much, but you keep craving more of the same, and you just can’t ignore it, so you eat some more. The irony of leafy greens, is that we never crave them, even though they’re the very thing that can stop those cravings. Your body keeps demanding more of the carb and fat heavy foods because it’s looking for nutrition, and since nutrition comes with calories, you feel the urge to consume calorie dense food. But unfortunately, potato chips don’t carry a lot of nutrition, so we’re never satisfied. Greens deliver a myriad of micronutrients (vitamins and minerals) to our bodies, which delivers the message that we’re satisfied, as long as we get an appropriate amount of macronutrients (proteins, carbs, and fats) to go with it. 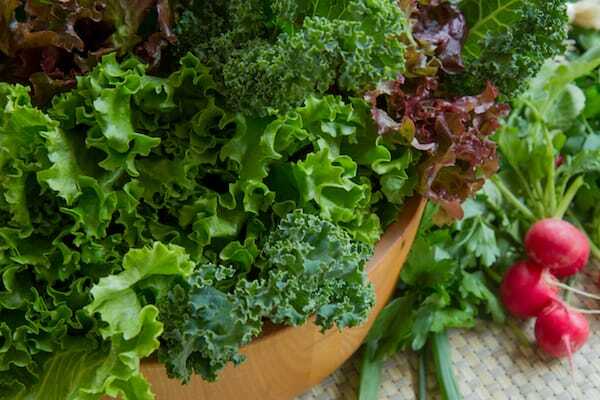 What kinds of leafy greens are best? It’s good to have a variety of greens to choose from, switching one out for another from week to week, to prevent alkaloid build up. For most of us, there’s most likely nothing to worry about, but there’s never anything wrong with taking precautions! Kale – has more iron per calorie than beef, and is high in fiber and vitamins. Broccoli Sprouts – contains 10 times more glucoraphonin, a cancer fighting compound, than mature broccoli, plus they’re easy to grow! Watercress – only five calories per cup, but full of vitamin k, zeaxanthin lutein, and beta carotene. 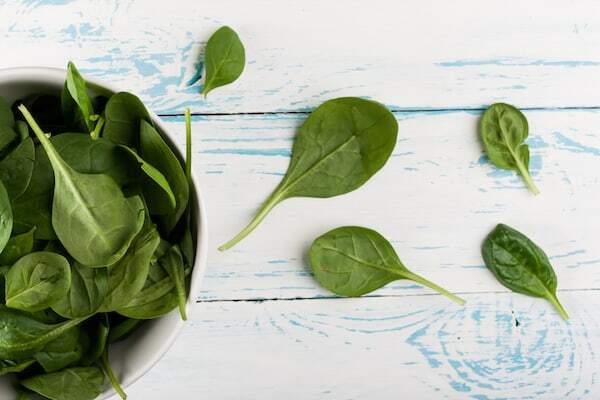 Of course, these are just a few of the greens you can use, and just a few of their benefits, but they’re ones that most relatively large groceries stores carry (the best we can find at our tiny town store is romaine lettuce!). Something about starting the day off right that makes the whole day go better. The same is true of food. When start with the healthiest thing possible, you’ll eat better all day! And the best part for busy days is that it only take a minute to use your drink blender to whip up a smoothie, especially if you have pre-frozen smoothie packs. Find over 60 healthy smoothie recipes here. Dried kale is similar to kale chips, except it’s 100% prep-free. We’re getting more and more of our vegetables freeze-dried through Thrive Life to serve as nutritious snacks for the kids, and while they don’t eat the kale in particular unless it’s pretty doctored up (apparently we adults are the only ones crazy enough to eat kale. ;)) because of Thrive Life, getting the kids to eat healthy snacks is no longer a problem – no matter how busy our day is! Speaking of freeze-dried kale, this is one of our favorite ways to use it. We like to make up a batch of power balls to keep in the freezer all the time! What could be easier than grabbing a popsicle on your way out the door? Nothing! You get all the benefits of a smoothie, and all the perks plus none of the guilt of a popsicle! Wrap your lunch in greens instead of tortillas! Raw wraps are a bit of a revolution. Romaine lettuce, swiss chard, and de-stemmed collard greens work especially well for wrapping taco filling, hummus, or any number of delicious wrap ingredients! I like the wrap making method in the video below, even though it’s a little more involved (because she steams the greens) than others. To be perfectly honest, I could sweet eat alfalfa sprouts by the handful, but broccoli sprouts have a bit of a peppery flavor, making them the perfect superfood replacement for lettuce on your sandwich! BTW, growing your own broccoli sprouts is ridiculously easy, fast, and cheap! Another way to make your breakfast a win! Just add a handful of spinach to your breakfast eggs to wilt in while you stir. I also like to put a handful of sprouts on my omelet – and for us, omelets are usually a quick breakfast-for-dinner. It goes without saying that the biggest factor in being able to eat superfoods on busy day is preparation. The key for me is to have a weekly prep session. You can make a week’s worth a salads, smoothie pops, collard wraps, and other healthy snacks to have at your finger tips all week. Thank you for a great post!! I love greens, and did attempt a green smoothie. It was a fail! I like the idea of the 30 day challenge and ideas for making green smoothies. Definitely something I needed help with.